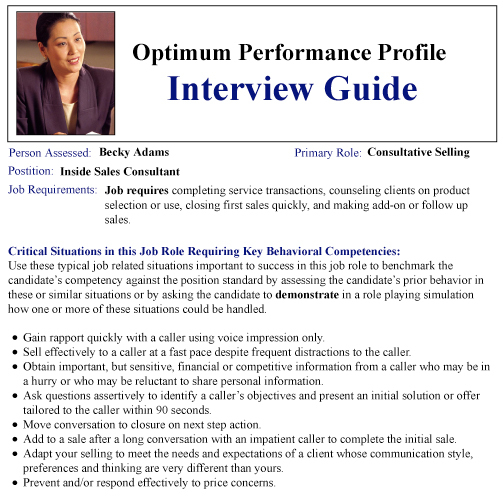 The Interview Guide that accompanies the full Optimum Performance Profile assessment enables you to utilize targeted, structured interviewing and reference checking around job-related behavior. The Interview Guide prints out questions appropriate to the primary job role for which the job candidate is being assessed that should be asked of all candidates, plus follow-up questions tailored to the possible strengths and weaknesses of each candidate. 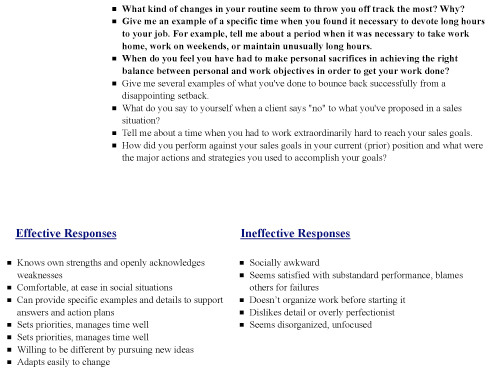 It also displays general guidelines of what to look for as effective and ineffective candidate responses. To minimize interviewer bias, the Interview Guide for each job applicant can be emailed to individuals who are conducting the interviewing without their having access to the raw job role scores in the Assessment Report. In lieu of raw scores, they will see the behavior traits for which the candidate scored within the range of top performers to verify in their interviewing and those behavior traits for which the candidate scored well outside the range of top performers to explore in follow-up questioning.